Nearly half of Londoners feel their health has been impacted by poor air quality, according to research commissioned by London Councils. The public polling sought to gauge the public’s understanding of air quality issues, and the impact it has on their lives. This briefing provides an overview of the findings. London Councils carried out the first specific air quality polling to find out how much Londoners know about pollution and the impact it has on their lives. 1,000 Londoners took part in its online research. Below are some of the key findings. • Those who use public transport. • Those whose health is affected. Private vehicles, vans and Lorries were seen as some of the main causes of pollution, followed by delivery vehicles and taxis/private hire vehicles. Nearly a quarter of people think air pollution blown in from the continent is another one of the main causes of air pollution. Longer term residents (5+ years) consider road transport to be one of the main causes, more so than newer residents. Less than a quarter of respondents had heard of the GLA’s air quality advice service. Of the people who didn’t use the service a third would consider using it, and over half said they would find it useful. Nearly half of respondents said poor air quality had had a direct impact on their health, with asthma, breathing difficulties and coughing being the most frequently reported symptoms. People aged 25-34, those who live in inner London, and those who cycle or use public transport and those with children felt most affected. 39% of people said air quality impacted on decisions they made regarding their health. Nearly a quarter of people (22%) say air quality affects their choice of school for their children. When asked if their children’s health had been affected by air pollution, 12% of respondents said yes. Over a third of people say air quality affects where they choose to live in London. People aged 16-44, as well those with children, and those from a BAME background were more likely to say this. Over a quarter of people said they changed their behaviour on days when air pollution is high. People aged 55+ were more likely to stay indoors. Just over a third say it affects their decisions when deciding their commuting preferences. Over half of respondents use public transport as their main commute – this is across all ages apart from those of retirement age. Those from a BAME background are more likely to use it for commuting, as are those who live in inner London. Nearly half of people questioned said they would change their transport habits in order to improve air quality. Actions people were willing to take included walking/cycling more, followed by using public transport more, and reducing the number of car journeys they make. A quarter would choose a cleaner model of car, while only 9% would pay more to drive in London. Less than 0.5% of respondents who owned a private vehicle owned a fully electric model. This is in contrast to 69% owning petrol, 25% owning diesel, and 5% owning a hybrid model. 71% of people in the survey said they didn’t cycle in London. Of the people who did, 12% cycle as part of their commute. These cycle commuters are more likely to be male, younger and living in inner London. Over half of people who cycle say that high air pollution negatively influences their decision to ride, especially those whose health is affected. Alongside the earlier stated aims of this research, London Councils hopes that it will flag concerns of Londoners and ensure air quality gains more attention and traction from key decision makers. London Councils and boroughs have a key role in tackling the issue and putting it front and centre of the capital agenda for improvement. London Councils supports a number of measures to tackle air pollution. We support the early implementation of the Ultra Low Emission Zone (ULEZ) (in 2019) to ensure that the benefits of this policy are manifested as soon as possible for London residents. We also support, in principle, plans for an expanded ULEZ beyond the current Congestion Charge Zone, although this would need to be done in coordination with the boroughs to identify the best possible boundary route. We seek assurances from TfL that any surplus income from the ULEZ and emissions surcharge will be ring fenced and used for measures that improve air quality standards in London, for example investment in electric buses, electric taxis, electric charging points or more sustainable modes of transport, especially walking and cycling. Related to this, we believe the government needs to review financial incentives, such as Vehicle Excise Duty, so as to encourage the take up of the lowest polluting vehicles to reflect concern for both CO2 and NO2 emissions. Linked to this are plans for a diesel scrappage scheme in London, but also nationally, which London Councils support despite recent government rejections of this proposal. Another key priority of the new Mayor is to encourage modal shift. 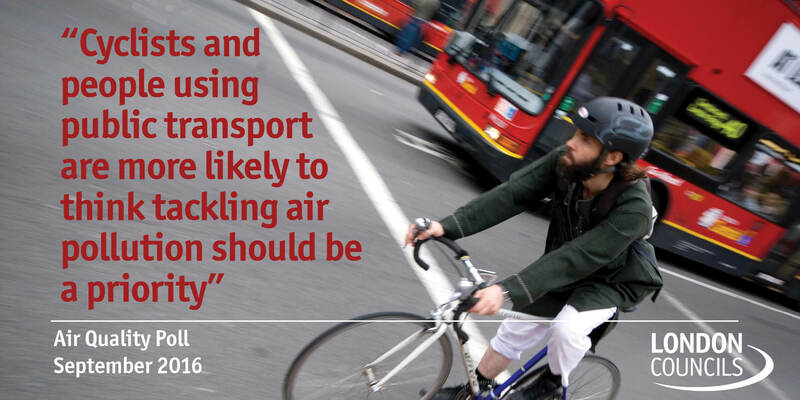 We believe that plans to increase in modal shift to more active and sustainable modes of transport is key to London reducing air pollution, but also providing a raft of other benefits to its residents. As the polling shows, residents are willing to change their travel behaviour. Additionally, we support increased investment in cycling infrastructure as this will help people feel comfortable to cycle in London, whilst making it more convenient, where this might not have been the case before. We encourage TfL to work with individual boroughs and sub-regional groups to ensure that the best possible solutions can be applied in different contexts across London. Nationally we call for the national government to ensure that EU air quality regulations and targets remain in place, or are strengthened, post-Brexit. With this in mind, we support calls for the government to draw up a new overarching Air Quality Strategy for tackling all air pollutants, produced by all sectors from transport and industry to energy and farming, with annual reports on progress. You can see our submission to the first phase of the Mayor’s air quality consultation in the section directly below this.